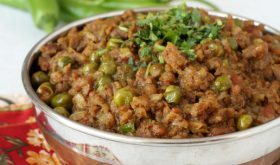 A classic North Indian non veg recipe using mincemeat (lamb) and fresh green peas, Keema Matar, is a popular dish in our home and among friends. It is a much requested dish for pot lucks. Mincemeat (lamb) works best though you could use chicken or beef in its place. I always make the curry with lamb aka keema. I froze a kilo of green peas that I bought last month towards the end of the winter season since I like to add them to most korma style dishes or to prepare peas paratha or Keema Matar, both of which are favorites in our home. Heat oil and ghee in a pressure cooker, add green cardamom, black cardamom, cinnamon stick, cloves and bay leaf and allow to sizzle. Add green chilies and chopped onions and saute till the onions turn transparent, approx 5 tms. Add the ginger garlic paste and saute for 3 mts. Add the minced meat and turmeric pwd and cook on high without lid for 4-5 mts. Stir in between. Reduce flame and cook for 5 mts. Add the red chili powder, coriander powder, cumin powder and salt and mix well. Add the chopped tomatoes and cook for 3-4 mts on medium flame. Add a 1 1/2 cups of water and yogurt and place lid and pressure cook up to 3 whistles or until the meat is almost cooked. Turn off heat. Allow the pressure to come down. Open lid and add the fresh green peas. If you want more gravy, add a little more water at this stage. Cook with lid on low flame for 10 mts or till you get the desired gravy consistency. Add garam masala pwd and mix. Turn off heat and remove to a serving bowl. 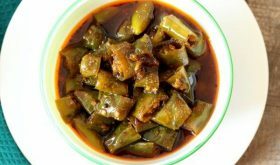 Garnish with fresh coriander leaves and serve hot with rotis, pulao or white steamed rice. If not using a pressure cooker, add 2 cups of water, place lid and cook over medium flame. Tomato puree can be added instead of chopped tomatoes. Potatoes can be added too. Add them after the tomatoes are cooked and before adding water. 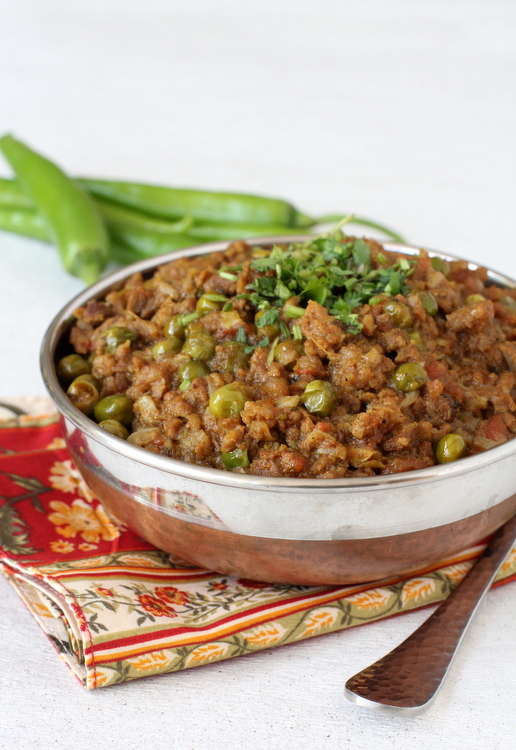 By Sailu Published: March 20, 2013 Among Indian non veg recipes, Keema Matar is a gem. 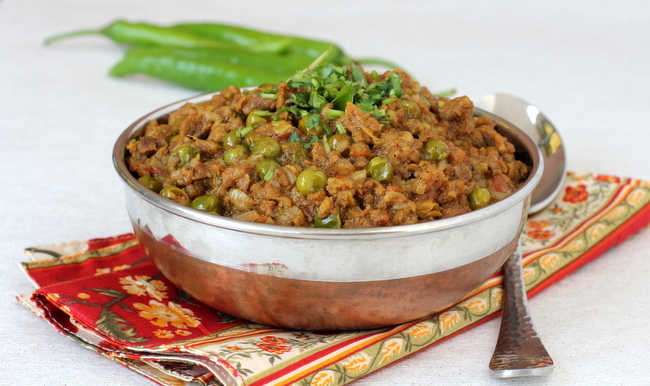 Mincemeat green peas curry is a spiced North Indian style dish that goes well with pulao, rice or roti. How much Garam masala pwdr? do we need to add water for ground chicken ?? Yes, a little less compared to lamb keema. awesome keema matar nice idea its very delicious dish …………………………. is it possible to have a page depicting with pictures …what you mean when you use ingredients that can vary greatly … like onions or tomatoes … it will help novices like me trying to cook … when I know to use a ‘big’ vs ‘medium’ tomato – because these can vary greatly (even what big or medium or small means varies) and can really change the recipe? I understand your issue. Will try to do so in future posts. Thanks for your suggestion. Thank you very much for the fail-safe recipe, Sailu garu. I followed your recipe but used frozen peas. My pressure cooker is European (i.e., no whistles), so I estimated 10 minutes cooking time under pressure. Your instructions produced the best keema matar I’ve ever eaten. thanks for this simple but delicious recipe. Hi Looks amazing.. Can I use Soya Kheema instead of meat? Can I make this without keema, and only matar? I want to make it a veg dish. Please reply? This is the first time I’ve heard of this dish, I’ll make it tomorrow! But I don’t have ghee, will the flavor be very different if I were to use butter?